PCD is a format used by Kodak equipment for storing photographs on photo CDs and for saving pictures created with Kodak photo processing hardware. Technical characteristics of PCD files are as follows: resolution of 3072x2048 or 6144x4096 pixels and 24-bit color. Another technical issue associated with PCD is compatibility with software; this format is only supported by expensive programs like Adobe Photoshop CS5 with Kodak Photo CD plug-in, Corel PaintShop Pro X4, etc. The easy and cheap way to view PCD files with less expensive software is to convert PCD to GIF. GIF format is very widespread among users and, thus, is supported by all major graphic viewers and web browsers. All you need to quickly and easily convert PCD to GIF in batch is some time and a good batch image converter. 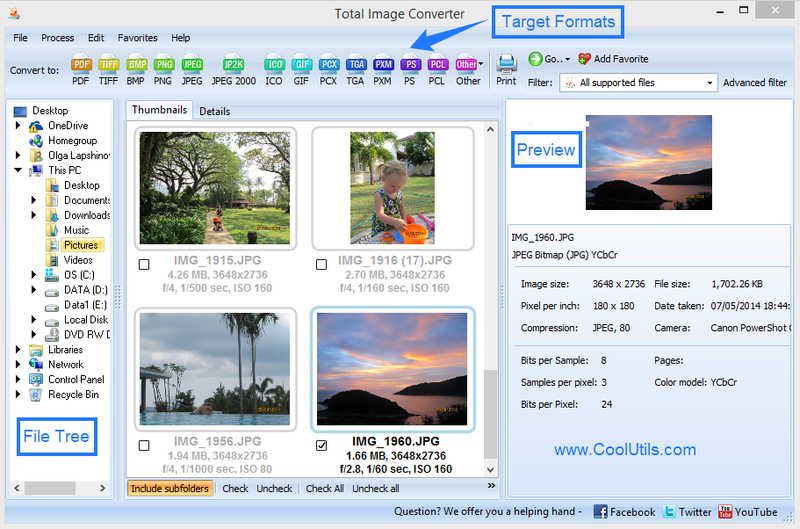 We suggest you trying Total Image Converter by CoolUtils. Even though it is oftentimes referred to as PCD GIF converter, in fact this program is a multifunctional tool. 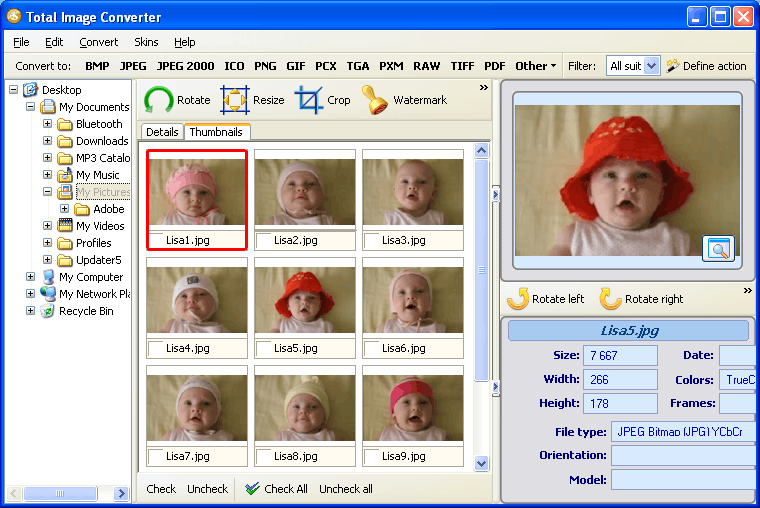 First and foremost, Total Image Converter supports batch conversion. You can process up to 150 files at a time by only making a few simple clicks. You don't even need to upload the PCD files - CoolUtils converter will make a list of all image files saved on your computer automatically! Second, Total Image Converter is a perfect replacement for editing software like Photoshop when it comes to resizing, rotating and cropping files. It's easy and does not require any special technical knowledge. 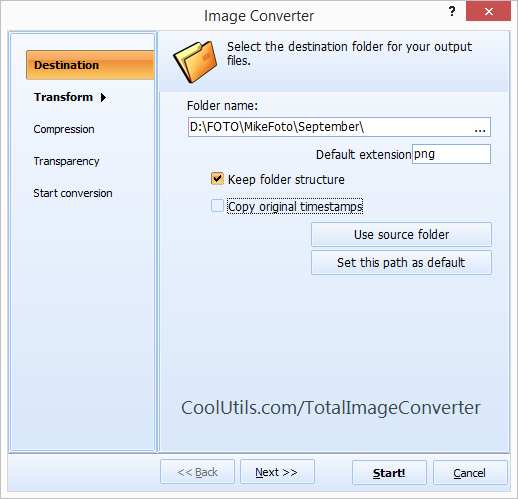 Third, Total Image Converter supports various image formats, both, input and output. 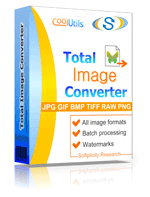 You can convert virtually any image into TIFF, JPEG, RAW, PNG, BMP, PSD, TGA and more. To try this product for free for 30 days, please, download a trial version now. There are no hidden charges or obligation! Use it and see whether it meets your needs before buying!